1. We start with news that will gladden every modeller interested in the early history of the helicopter. 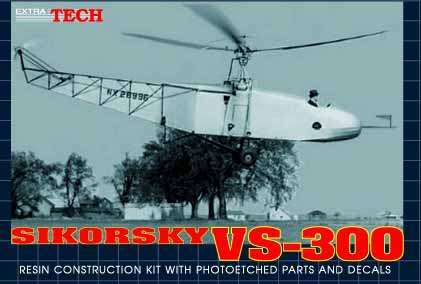 ExtraTech have just released their resin and etched brass kit #EXA7204 of the Sikorsky VS-300. All we know at the moment about the variant(s) covered by this kit is that the picture on the box shows a photo of Igor at the controls of NX28996 in its final VS-300-Ga configuration at Stratford in April 1942, when it flew in formation with the XR-4. 2. Fujimi's latest 1/72 JASDF KV-107/II-5 (#27034) is now available. It carries the colourful 'White Heron' scheme applied to a Hamamatsu Air Rescue Squadron aircraft 04-4852 to commemorate the 50th Anniversary of the Japan Self Defense Forces. 3. Also now available is Dragon's 1/144 UH-60L pair (#4578). The kits feature complete interiors, and the sliding side doors can be positioned open or closed. Optional pylons with drop tanks are included. 4. 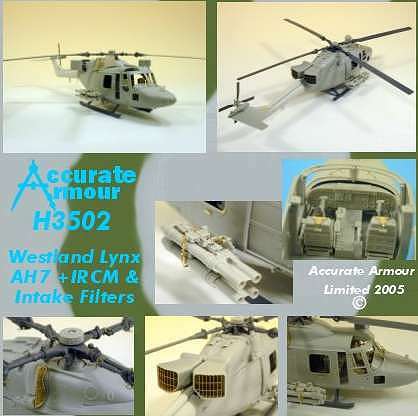 Accurate Armour are now accepting pre-orders for their long awaited 1:35 Lynx AH-7, armed with the TOW missile system. The production version of the kit will be on display for the first time at the IMPS Scottish Nationals in Perth, 23rd & 24th April. Features include 'super-detailed' TOW missile systems and interior with crew harness details. Sheet glazing and pre-cast transparent resin castings are also supplied and rotor head, blades and skids are cast in extra-strength 'hi-temperature' resin. Available in two versions, H3501 and H3502, the second of these has additional IRCM exhaust cowls with etched brass baffle plates, and optional air intake sand filters. The comprehensive decal sheet includes stencilling, titles for both Army and Royal Marines aircraft, and a wide variety of serials. German Army 93+71, 'Fly Out' (disbandment) of HFS80, Basepohl, 14-Sep-94 (not 1999 as it says in the instructions). The scheme commemorates the local town of Mecklenburg-Vorpommern. MAK-81072, RAF 32(TR) Sqn. Squirrel HCC.1 (Miku?). 8. Since Dec-2004, Eduard have been re-issuing all their most poular canopy and wheel masking sets cut in a new material 'based on yellow Japanese Kabuki tape' rather than the previous rather inflexible beige vinyl material. The new sets are called 'Eduard Mask' whereas the old ones were 'Express Mask'. USMC 815105/411/MP from HMA-773, NAS Atlanta 1976-78. Gloss Marine Green with a yellow tail band. Spanish Navy; any two of eight Z/HA.14 Cobras, originally titled 'Marina', then after 1978 titled 'Armada'. Gloss Sea Blue. HA.14-8 is preserved at the Escuela de Suboficiales in San Fernando, Spain. 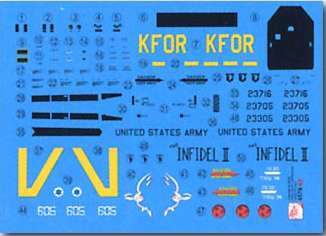 These are available in 1:72, 1:48, and 1:35, as are the latest Fireball Modelworks decal set #D03 which covers the US Navy HA(L)-3 “Seawolves”, formed in 1967 and disbanded in 1972. 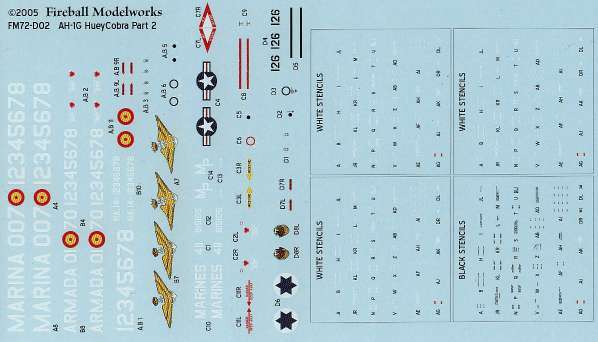 Rather than giving markings for specific aircraft, the aim of this sheet is to provide numbers, letters, badges, etc. to detail just about any Huey in the Seawolf inventory. By June 1971 this included twenty UH-1Bs, three HH-1Ks, six HH-1Ls, eleven UH-1Ms, and three UH-1Cs. 10. 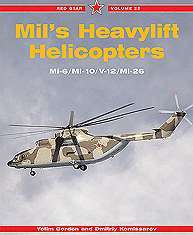 Due from Midland Counties Publishing in July is a new book from Red Star (Vol.22), "Mil's Heavylift Helicopters" by Yefim Gordon & Dmitriy Komissarov. This will cover the Mi-6, Mi-10, V-12, and Mi-26. The publisher's promotion says that "this book covers the development history and design of all the various types in detail and is well illustrated with numerous photos and line drawings." Thanks to Chris Beckett, Martin Smith, Joseph Osborn (Fireball Modelworks) and Derek Hansen (Accurate Armour).